We're celebrating Valentine's Day a lil early with a Share the LOVE giveaway! 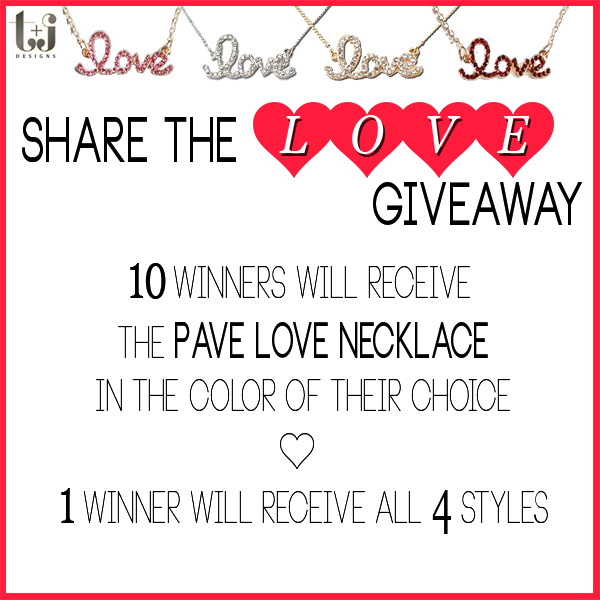 Just enter below for a chance to win one of our Pave Crystal Love Necklaces and don't forget to share on twitter, facebook and your blog for even more entries, there's no limit on how many times you can share for extra entries. LOVE the luxe rope and fuschia gem necklace!! I just got a set of Heart and Bow Trio stack ring, I loved it so much!! And this collection definitely named--"Delicates", which is absolutely right! It. Is. Delicate! I loveLOVElove the Luxe Pink 18K Pave Link Bracelet! Love the Luxe Circle Crystal Necklace and the Gold Double Large Chain Link Necklace! I love the love necklaces, just perfect for Valentine's Day! Love the love ring and the mini hearts ring! My favorite piece is the Mother of Pearl Rose Gold Necklace! I'm really wishing I had more bracelets right now. The Pearl Love bracelet is beautiful, and just the thing I've been looking for. My fav piece are Swarovski Starburst earrings. my fave piece: gold mini star stud! I love the Luxe circle crystal necklace! The Enamel Bow Tie Rings are adorable! I am loving the Love necklace, Luxe Rope & Green Gem Necklace, Pave chain bracelet. btw my eyes got excited when I saw the giveaway. I hope I win. crosses fingers. My favourite is the Love & Heart Rose Gold Necklace. I really like the red heart ring. Thanks! I really like the Luxe Bow Pave Ring! i love the Gold Chain Link Necklace!! I love the necklaces...each and every one! The Melinda Set is beautiful! I love the Luxe Pink 18K Pave Link Bracelet! I love the Luxe Flower Crystal Necklace! I love the bow bracelet! My favorite piece is the Minty Drop Necklace. I think that the Mini Hearts Rose Gold Ring is so cute! oh by far my favorite is the luxe red pave link bracelet! love you guys!!! Love the Gold Double Crystal necklace! My favourite piece is the Pave Chain Bracelet! I have fallen in love with several of your pieces, but the one that truly stole my heart is the Silver Luxe Braided Necklace! Love & Heart Rose Gold Necklace! My favorite piece is the Luxe Baubles Necklace or the Emma Bracelet Set. I like the Turquoise cocktail statement ring... so pretty! It was very hard to choose just one favorite but my eye kept going back to the Love & Heart Rose Gold Necklace. My fave is the triple heart pave in white gold! I love the luxe link page necklace! It's too hard to choose just one but I love the 18k white gold plated pave link bracelet. 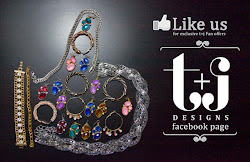 Love this bracelet http://www.tandjdesigns.com/view-all/luxe-18k-pave-link-bracelet/, also love this one http://www.tandjdesigns.com/view-all/floral-austrian-crystal-bracelet/.